The megayachts, fully-custom and developed in different strategic lengths (52, 61 and 75 meters), share the same inspiring concept, perfectly fused with the CRN heritage. The Oceansport Series adds to the ocean going properties of the CRN naval platform a sporty profile, typical of Omega Architects’ design, with low gross tonnage and sleek iconic shapes. Each version is designed and engineered in proportion and makes the most available space for guests cabins, salons and the beach club with wellness and fitness area: sauna, gym, infinity pool and swim platform. All the three of them have a sleek styled exterior line emphasized by the long horizontal shape where darkened glass windows connect into one visual line on both main and upper decks. Each version has full height windows on both sides the salon on main deck aft, offering stunning views over the lowered bulwark and protecting guests’ privacy at the same time. Moreover, the new Projects have an integrated hull and body through an arch, which allows the split-level beach club area. Indeed, this is a unique feature: the arch extends the aft beach area forward to the main deck seating area. These characteristics are absolutely innovative and original; the sleek low profile designed for the Oceansport line shows how a stately ocean going yacht can have a sporty character as well, with the near vertical bow and vertical pilot house window. “Our relationship with CRN is based on strong connections”– said Mr. Frank Laupman, Chairman of Omega Architects – “We cooperated with the prestigious shipyard in the past: Omega Architects were part of several projects. Yalla was the first yacht to be started with us from scratch. Following closely Yalla’s success, we created a momentum that can be continued. The new Oceansport Series represents an exclusive and unique development: the series is based on existing CRN platforms to deliver a customized project and it combines a sporty soul with elegance and comfort: it is designed to be a super yacht, offering exclusive travelling in safe relaxation, exploring shallow waters and anchor closer to the shore ”. The 52-meter Oceansport is a fully-custom, steel and aluminum vessel 10 m wide overall. It is developed on four decks and it includes 5 VIP cabins, an Owner’s suite, thereby accommodating 12 guests, as well as 10 crew members. On the main deck, the yacht offers a spacious aft deck with sliding doors to a salon with several comfortable sofas and seats, and the dining area. Forward is the large fully equipped galley. The lower deck offers 4 guests cabins: 2 double and 2 twin, with ensuite bathrooms. The Owner’s cabin is aft on the upper deck, while towards the bow there is the technological pilot house. Through full height bent glass sliding doors, guests come to the wellness area, with sauna, day head, massage room and sofas. The covered interior then opens up to the flush infinity pool and a few steps down to the swim platform. This part of the yacht gives a very open and spacious feeling with views to the aft and the sides, where the bulwark opens up. The 52-meter Oceansport comes with a double garage on the main fore deck for tenders of various lengths. The yacht is equipped with 2 x CAT C32 1081 kW @ 2300 rpm engines, that push it to a cruising speed of 14 knots and a maximum speed of 15 knots and class certification Lloyd’s Register of Shipping LR X 100 – A1 – SSC – “Y”, MONO, G6, X LMC MCA LY3 compliance. The 61-meter Oceansport is a fully-custom, steel and aluminum vessel 11 m wide overall. It is developed on four decks and it includes 5 VIP cabins, an Owner’s suite, thereby accommodating 12 guests, as well as 14 crew members. On the main deck, there is the full beam Owner’s stateroom with lounge area, study and bathroom. The yacht also offers a spacious aft deck, with sliding doors to the salon and the dining area. Forward is the large fully equipped galley. The lower deck aft presents a VIP guest cabin, with lounge area and ensuite bathroom. On either side of the spiral staircase is a twin guest room and, more forward, two double guest rooms. Full height bended glass sliding doors lead the guests to the wellness area – that includes sauna, day head, massage room and another lounge area – through which they come to the pool and the beach club. Accessing the upper deck, a private staircase or an elevator guides to the pilot house, passing through a cozy area. The 61-meter Oceansport comes with a double garage on the main fore deck for tenders of various lengths. The yacht is equipped with 2 x CAT 3512C 1230 kW @1800 rpm, that push it to a cruising speed of 14 knots and a maximum speed of 15 knots, certification Lloyd’s Register of Shipping LR X 100 – A1 – SSC – “Y”, MONO, G6, X LMC MCA LY3 compliance. The 75-meter Oceansport is a fully-custom, steel and aluminum vessel 13 m wide overall. It is developed on four decks and it includes 5 VIP cabins, an Owner’s suite, thereby accommodating 12 guests, as well as 22 crew members. 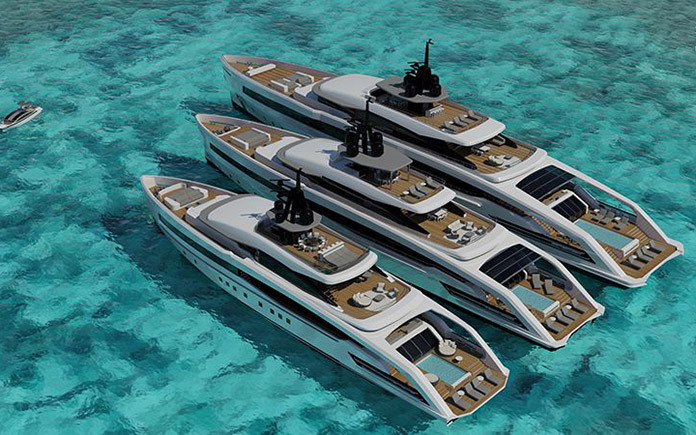 The 75 m project is conceived in two different layouts. On the main deck, the yacht offers a spacious aft deck, with sliding doors to the salon and the dining area. Forward is the large fully equipped galley and then the Owner’s quarters. This longest Oceansport offers a lounge area and an ensuite versatile room to use as an office or breakfast room, his and her bathroom, his and her dressing room. It also has a cozy recessed balcony for two: an intimate retreat from everything else. The lower deck differs in the two layouts: the first one has 5 double guest rooms with a VIP room; the second one offers 4 guests cabins – each of them with a private bathroom – arranged as one double, one twin convertible into a double, two VIP with large lounge area. Ahead are the comfortable crew quarters. Also the upper deck has two layouts, both of them panoramic and wind-shielded. The first layout has a double captain’s cabin with study plus an extra staff cabin with Pullman bed. The aft deck is for guests only and the sky lounge opens up with full height sliding doors, connecting the interior to the enormous aft deck. The second layout of the upper deck offers a second Owner’s stateroom aft (the first one is located on the main deck) with ensuite bathroom. The 75-meter Oceansport comes with a double garage on the main fore deck for tenders of various lengths. The yacht is equipped with 2 x CAT 3516C-Dhd 2000 kW @1800 rpm, that push it to a cruising speed of 15 knots and a maximum speed of 16 knots, certification Lloyd’s Register of Shipping LR X 100 – A1 – SSC – “Y”, MONO, G6, X LMC MCA LY3 compliance. The Italian shipbuilder CRN was established in 1963 in Ancona (Italy). Since then, the town has always been the seat of CRN’s headquarters, offices, design and construction departments. CRN specialises in the design and construction of fully-custom, steel and aluminium megayachts up to 90 metres in length. Led by Chairman and CEO Lamberto Tacoli, CRN’s shipyard extends over an almost 80,000 sq m area which also includes a large, historical private marina. It is here that all megayachts of the CRN fleet – which can currently boast more than 180 yachts in the water – are built, besides some aluminium models for other brands of the Ferretti Group, which CRN belongs to. CRN develops fully-custom yachts characterised by state-of-art solutions which are real trend-setters in the yachting world. The Company can rely on a team of professionals that conceive the best-performing bottoms and outstanding naval and design solutions, and of internationally-renowned architects and designers in charge of the yachts’ functional and aesthetic design. CRN also includes an Engineering Department consisting of highly qualified engineers and technicians, and an Interior Design Department, that, together the various project managers, the production team, and all workers, are the very heart of the Company. Moreover, thanks to its Sales and After-Sales Division, CRN takes care of each and every pleasure vessel it creates even after it has been delivered, ensuring technical support to its Owner and its crew.